With the latest update has the iPhone and iPad received over 200 new features, some of them are a little more hidden than others. Many have previously criticized the notification system in iOS, which was designed so that you only see the final notice, and which in turn meant that anyone could be lost if you had been away a long time from the phone. 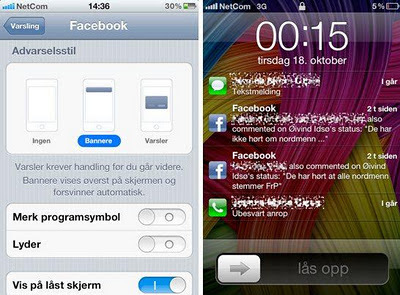 In iOS 5, Apple has been inspired by Android, but also refined the concept. Under notification settings you can choose what kind of notification you want per app. In my example, we get banner notification from facebook and displays them on the lock screen (to right). There you can then just drag the Facebook icon from left to right and then jump directly to the Facebook update. If you installed iOS 5, you can now pull down the notifications as a drop down from the top of the screen (identical with Android), so you can see a quick preview of the latest SMS messages, emails, etc. The camera app also has some upgrades that are worth to appreciate. Use the volume up button on the side of the phone as the shutter button (set focus by touching the screen). You can also use a finger and drag to the right to jump directly to the photo album when you have the camera application open, and back again to take pictures again. Be aware that you can double tap the home button when the screen is off (on the lock-screen) to bring up a shortcut directly to the camera. The extra nice is that you then can take pictures (and look at the pictures you took in that particular session, but not the rest) without unlocking the phone with the code first. There are now many solutions to send "free" messages to others, including Kik, Whatsapp, newcomer ChatOn from Samsung, etc. Several of these also have apps for multiple operating systems. 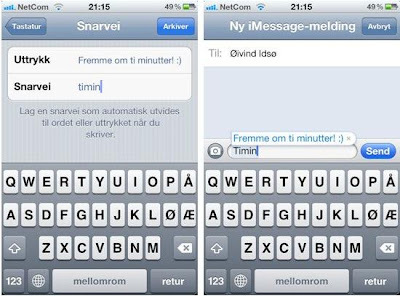 The text message submit-button is green if the phone is going to send a normal SMS, but it turns blue if the message is sent via iMessage. Easy to see the difference. If there is any expressions you type regulary: "A little busy - call you later! ", "sleep well", etc. The shortcut is created simply by entering a term in the top field and text link below. Once you enter the letter, it is replaced by the former as in the example to the right. You can create shortcuts to frequently used phrases. You go into settings, general, keyboard, and find "shortcuts" at the bottom of the page. 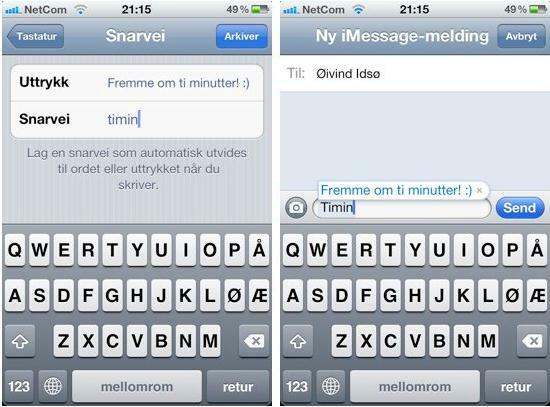 You create a new shortcut, type in first term and any shortcut. 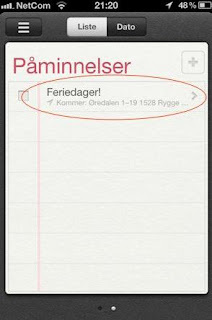 One of the new apps in iOS 5, Reminders, an app that lets you create to-do lists and possibly put alarms on them. The smart is that the alarms do not need to go off at a given time - you can also do it so they go off when you arrive or travels from one place. This feature is only available on iPhone 4/4s. 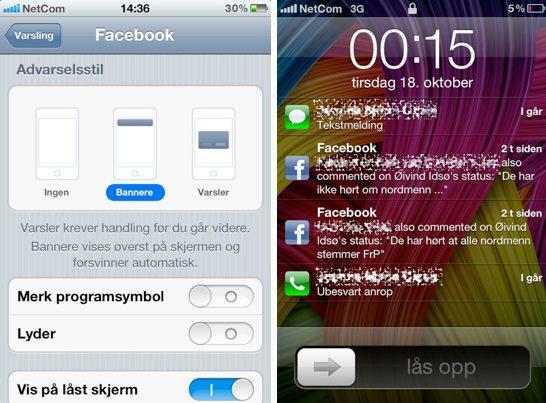 0 Respones to "IOS 5 cool trick for iPhone 4/4s"